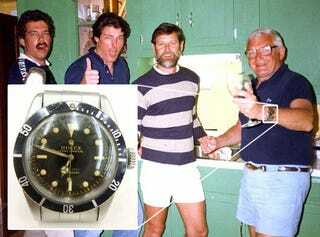 That smiling white-haired guy with the wine glass is Bob, a Navy doctor who put his watch for sale on eBay for $9.95. He got it cheap at a Navy Exchange fifty-two years ago. The final auction price: $66,100. The reason isn't that Bob and his watch got to party with Superman (yes, that's Christoper Reeve). It's a lot better than that. Soon after posting it in eBay, the price skyrocketed to $30,000. After talking with his son, they found out that the watch was a collector's item coveted by watch nutters all over the world: The Rolex Submariner Ref 5510, nicknamed the Bond Rolex because Sean Connery wore the same model in Dr. No, Goldfinger and Thunderball. Bob's Submariner is not the actual watch used by Bond, however. He bought it on a Navy Exchange on a lost rock called Kwajalien Atoll.